This installation covers the Defi Link EGT gauge and is identical for the Defi BF EGT. Installation is similar for all other EGT gauges except for the electrical connection to the gauge itself. Most brands that do not have a main "head unit" for the gauges like Defi Link and BFs, will have a box that is connected between the probe and the gauge. 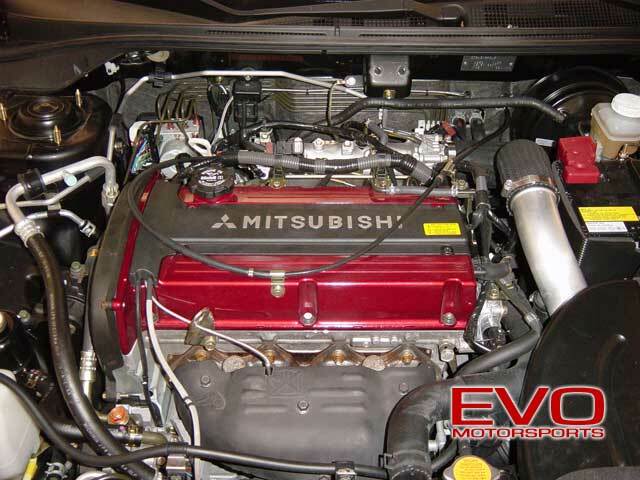 As with the boost gauge, this install is geared towards installing the EGT probe. How and where the gauge is mounted is totally up to you... 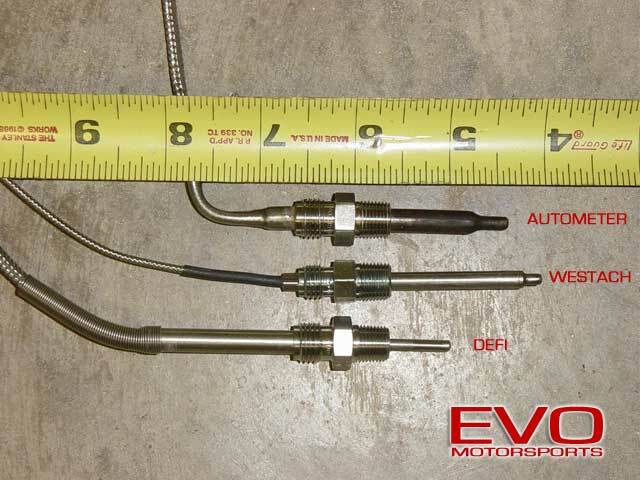 NOTE: The way we installed this EGT probe fitting does not require the exhaust manifold to be removed from the car. While installing EGT fittings this way has never been a problem for us in the past, it certainly isn't the absolute "ideal" method either. Any metal shavings that run through your turbine housing could potentially be trouble for the turbo, so use this method at your own risk and follow the tips to keep it as clean as possible. 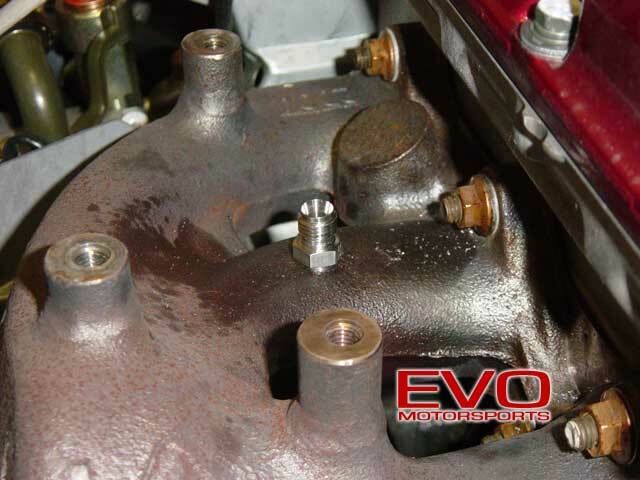 If you have any concerns at all, the only absolutely safe method is to completely remove the manifold from the engine/turbo, drill and tap it and then clean it out well prior to reinstallation. Probably the biggest decision to make in this installation is where to mount the EGT probe. Ideally, the probe should be mounted in the exhaust manifold runner of the cylinder most likely to run the leanest. Based on our 4G63 experience, this would normally be cylinder #1 or #2 and, judging from plug readings, the Evo 4G63 is no different. 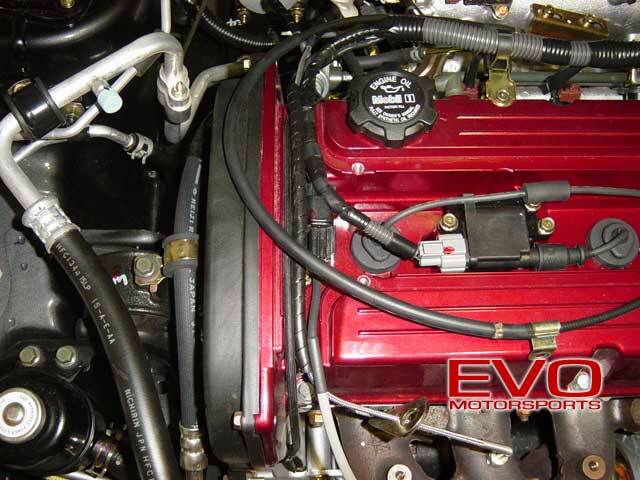 The EGT probe can pretty much be tapped anywhere in the exhaust manifold that has room for it. Likewise, the probe can also be tapped directly in the O2 sensor housing or in the downpipe. Mounting the probe after the turbo (O2 housing or downpipe) has the benefit of not sending chunks of metal through your turbine housing should the probe ever break (or during the install), but the drawback is a lower, and some feel, more inaccurate reading. 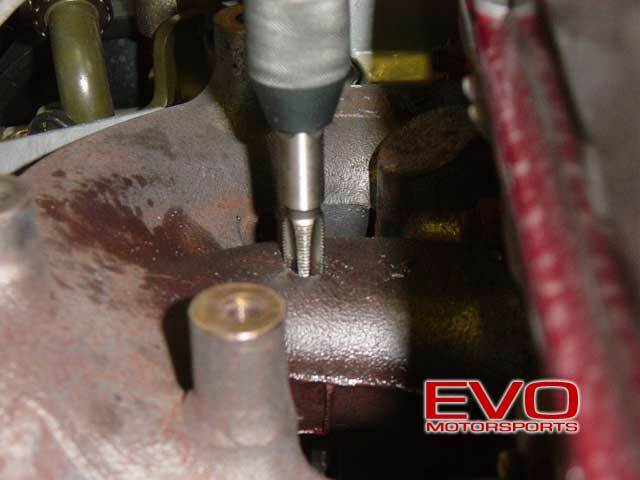 Readings can be anywhere from 100°-300°F lower than with the probe mounted in an exhaust manifold runner. Why? The turbine and O2 housings are very good heatsinks. For our install, we will be installing the probe in the #2 runner of the exhaust manifold. 1. 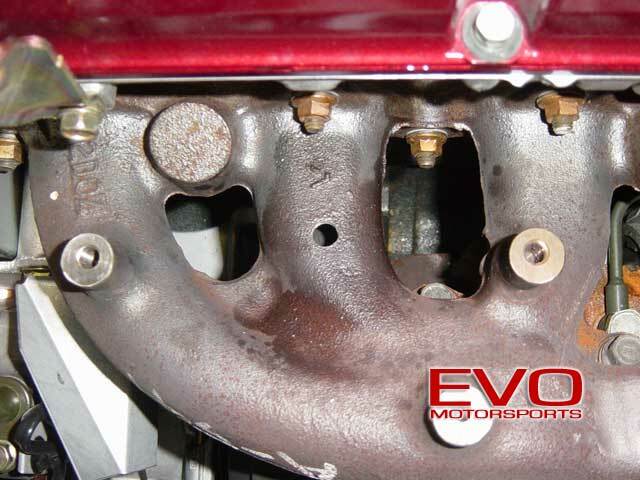 Begin by removing the (4) 12mm bolts holding the heat shield to the exhaust manifold. Also, pull the O2 sensor wire out of its holder on the left side of the heat shield. Then simply pull the shield off and set it aside for now. 2. Now you will need to determine where to mount the EGT probe. This is somewhat less of an issue should you choose to mount yours in the O2 housing or downpipe since there is more room inside. As you can see by the picture, different brands of probes intrude and protrude in varying degrees. TECH TIP: In addition to placement considerations for the probe, if you will be tapping the hole with the manifold on the car, make sure that you have room to actually work the tap without hitting the head or other obstacles! Care should be taken when using a probe that reaches deep inside like the Westach and, to a slightly lesser extent, the AutoMeter probes. For probes that insert deeper into the manifold, you may wish to install it in the heat shield bolt bung located on the #1 runner for added mounting height, or in the collector section of the manifold for added depth inside. Note that where ever you decide to mount your probe, the tip should be in the exhaust stream and not make any contact with the metal. Measure 10 times and drill once. 4. Once you have determined your mounting location, start with a pilot hole. Always use a sharp bit with cutting fluid or some type of lubricant on it. This will keep the bit from dulling as quickly and give you nice, clean, easy to drill holes. As you can see in the photo, we stopped just as the hole began to break through the runner. Now it's time to break out those gloves (no latex) and definitely eye protection, which you were already wearing, right? Start the car before drilling any further. The exhaust will keep most, if not all, shards from falling into the manifold. In fact, shards will be blown up and away from the drill bit, so long sleeves would also be recommended. With the car running at idle, continue drilling the pilot hole. Reapply cutting fluid/lubricant as needed...the hot exhaust/manifold will burn it off quickly. 5. Once the pilot hole is completed, change drill bits to the tap size (21/64" or 8.3mm). With the car running, drill the hole using cutting fluid/lubricant. 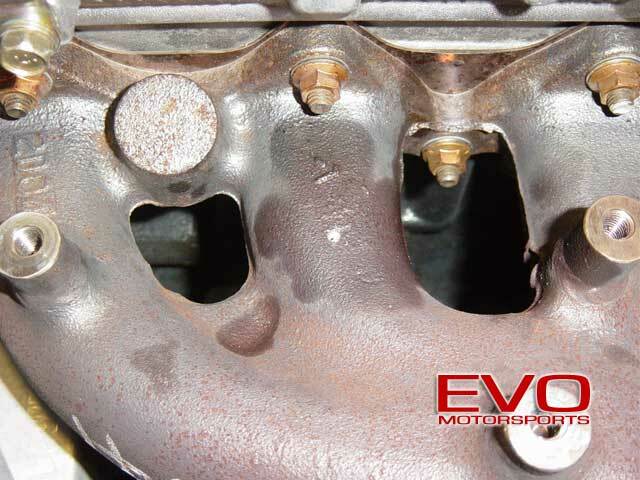 Note that the exhaust manifold has a slight downward slope in this area when attached to the car. If you want the probe to stick straight up, drill the hole with the bit parallel to the head/valve cover, not perpendicular to the manifold. 6. Once the hole is drilled, it's time to break out your 1/8 NPT tap. Add cutting fluid/lubricant to the tap and with the car running, begin tapping the hole. 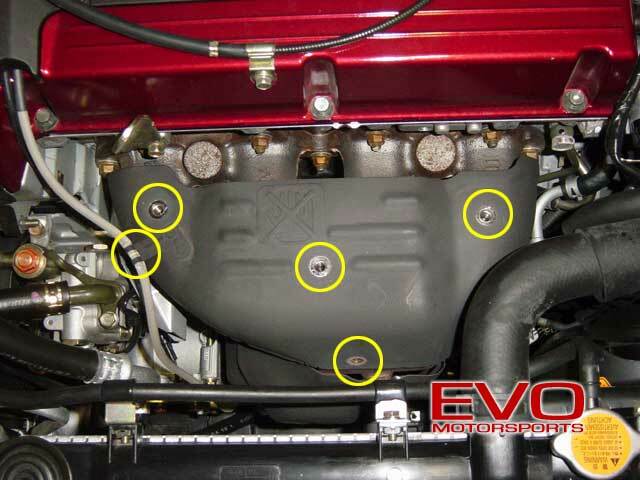 As you will note in the picture, the tap is parallel to the head/valve cover and you can see the angle on the manifold relative to the head as mentioned in Step 5. 7. If everything went as planned you can shut the car off and your finished tapped hole should look similar to this one. 8. Insert your EGT probe fitting and tighten it down. Be careful not to strip or cross-thread the fitting or your tapped hole. 9. You can now loosely fit the EGT probe into the fitting to determine your wire routing. 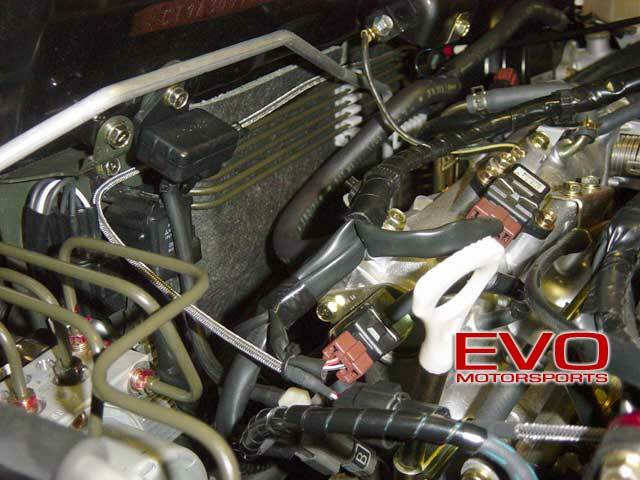 For ergonomics, we ran the wiring through the top of the valve cover next to the O2 sensor wiring. To protect that nice magnesium valve cover from being scratched by the stainless braiding on the wiring, we added loom to the wiring where it runs over the valve cover. 10. The probe end of the Defi probe harness comes a few inches out the backside of the valve cover. From there, we connected our gauge side of the harness, ran it neatly across the firewall and then into the cabin. Tie straps secure the harness to the FPR solenoid and the brake lines on the firewall. 11. If your probe interferes with the heat shield installation, mark the location on the shield and cut out enough material to allow the probe/wiring to come through without rubbing on the heat shield. 12. When everything is test fitted and connected properly, go ahead and tighten the probe into the fitting and reinstall the spark plug cover and heat shield. Make your connections to the Defi Control Unit (or box) and then to the gauge itself. When everything is connected, start it up and make sure your gauge works!